Galco SB6 1.75" Belt FREE SHIPPING! 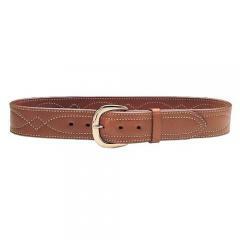 1.75"- wide lined belt made with fancy stitching. Includes solid brass buckle. Available in tan. All of Galco's belts are sized by measuring the distance from the tip of the buckle tongue to the center hole of the belt. Typically it is about two inches larger than the size of your pants. To determine the perfect belt size, simply measure an existing belt (of similar width) from the hole you use to the other end of the belt and include the entire buckle. ©2002-2019 CopsPlus.com: Galco SB6 1.75" Belt FREE SHIPPING!